The best sort of picnic food is food that doesn’t need cutlery! Plus it’s got to be robust in flavour. When you’re out in the countryside or on the beach you don’t want to be picking at dainty subtly-tasting bits; you want something that will fill you up, something you can eat on the go. Let’s start with an old favourite. First make the pastry. Sieve the flour and salt into a bowl. Add the fat, chopped into small pieces. Using a knife, ‘cut’ the fat into the flour. Then, using your fingertips, continue to incorporate the fat into the flour by rubbing it in. Lift your hands high above the bowl as you do this to let air into the pastry. When you have a fine-crumbed mix, add cold water a teaspoon at a time. Using the knife again, bring the mix together. When it starts to bind, use your hands to lightly knead it to a smooth dough. Try not to handle the dough too much as this will make it hard. Wrap the dough in clingfilm and leave it in the fridge to rest while you prepare the filling.Now preheat the oven to 180oC, gas mark 4. Grease a baking sheet. Slice the meat into thin slices, then into strips and then into small pieces. Peel the potato, onion and swede and chop into small dice. Now mix the veg and meat together with seasoning. Roll out the pastry to about?” thick, then using an upturned saucer as a guide, cut out circles. Place some filling on half of each circle. Beat the egg lightly and use it to brush around the edge of the pastry. Fold the empty half over the filling and press together. Crimp the edge by twisting slightly with your fingers. Brush the top with beaten egg. Make a small hole in the pastry to allow steam to escape. Cook for 45 – 55 minutes until golden brown. There is discussion over whether the pasty should be joined at the top or the side; the side join is probably easier to hold and eat on the go. There is also disagreement over the filling and whether it should be mixed together or layered. Take your choice! 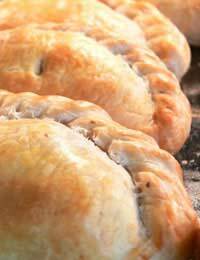 And as for whether it can be called a Cornish pasty when it’s not made in Cornwall … many a Cornishman would argue with you on that! From Cornwell, we’re off to Scotland. Traditionally Scotch Eggs are deep-fried but this a healthier baked option. Preheat the oven to 180oC, gas mark 4. Grease a baking sheet. Roll out the sausagemeat and divide into four. Roll the eggs in some flour. Place an egg on top of each piece and mould the sausagemeat around to completely enclose the egg. Dip into beaten egg and then roll in breadcrumbs. Bake for about 15-20 minutes or until golden-brown. A picnic wouldn’t be a picnic without sandwiches but even better than the traditional sandwich is the pita bread that opens up to create a pocket that is easy to carry and eat. Prepare before you set off and wrap individually-prepared pitas in foil. The filling shouldn’t be too wet though: if you want to fill them with salad, take a small bottle of dressing with you to add just before eating. Pop slices of ripe tomato and red onion inside the pita, sprinkle with freshly-chopped basil and maybe an olive or two. Serve with a dash of Italian dressing. Very thinly sliced brie with crispy lettuce, sun-dried tomato and a dash of French dressing. Mix chopped cooked chicken with bean sprouts, chopped celery and spring onions. Mix together ½ tablespoon soy sauce, ¼ teaspoon ground ginger and a dash of garlic powder. Add some to the chicken and fill the pita. Top with toasted sesame seeds. Add a little mayonnaise if you prefer.